This may seem like a mundane word, but it provides access to some amazing and interesting bits of food for thought. The biggest point to make is that to avoid blind spots institute checklists. Hospitals use checklists to save lives every time they insert an IV line. 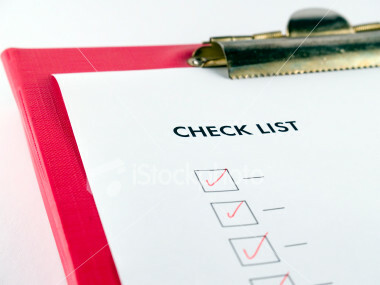 Checklists give people the best way to do things – a clear cut “right way”. In any business we do certain things over and over. Through the passage of time a certain amount of overconfidence can cause us to do things without thinking – think of the rate of auto accidents near to home; a route we take over and over and soon do as second nature. Even when we do institute an actual checklist in situations we have to be wary of checklist creep. We have to discipline ourselves not to short change a working system. To be candid, when we use checklists we make fewer mistakes. We all have things we do over and over again. Take these things and put them in checklist form. This is the one sure fire way to eliminate at least some of the blind spots we all share. This entry was posted on March 14, 2008 at 5:17 am and is filed under Context, Creativity, Cultural Ideas, Influence, Life. You can subscribe via RSS 2.0 feed to this post's comments. You can comment below, or link to this permanent URL from your own site.